These are among the findings of Pew Research Center’s new political typology, which sorts Americans into cohesive groups based on their values, attitudes and party affiliation, and provides a unique perspective on the nation’s changing political landscape. Before reading further, take our quiz to see where you fit in the political typology. The political typology reveals that even in a political landscape increasingly fractured by partisanship, the divisions within the Republican and Democratic coalitions may be as important a factor in American politics as the divisions between them. In some cases these fissures are not new – they were evident in six previous Pew Research Center typology studies conducted over the past three decades, most recently in 2014. Yet, especially within the GOP, many of the divisions now center on the issues that have been front-and-center for Trump since he first launched his presidential campaign. This study is based on surveys of more than 5,000 adults conducted over the summer. This was also the data source for our Oct. 6 report, “The Partisan Divide on Political Values Grows Even Wider.” These reports were made possible by The Pew Charitable Trusts, which received support for the surveys from The William and Flora Hewlett Foundation. The four groups in the Democratic coalition differ on a number of issues: While they all strongly support the social safety net, the Democratic-leaning groups are divided on government regulation of business, and government performance more generally. And like the GOP coalition, they disagree on U.S. global involvement. Solid Liberals are the largest group in the Democratic coalition, and they make up close to half (48%) of politically engaged Democrats and Democratic-leaning independents. Largely white, financially comfortable and highly educated (most are college graduates and nearly a third have postgraduate degrees), Solid Liberals overwhelmingly express liberal attitudes on virtually every issue. And their level of political activism in the months following Trump’s election sets Solid Liberals apart from all other groups in the political typology, left or right. Nearly half of Solid Liberals (49%) say they have contributed money to a political candidate or campaign in the past year; no more than a third in any other group (32% of Core Conservatives) say the same. And 39% of Solid Liberals report they have participated in a protest against Trump’s policies, which also is by far the highest share among the political typology groups. For the most part, Opportunity Democrats agree with Solid Liberals on major issues. But Opportunity Democrats are less affluent, less politically engaged and less liberal – both in their attitudes on issues and in how they describe themselves politically. One area of difference between Opportunity Democrats and Solid Liberals is on corporate profits: 40% of Opportunity Democrats say most corporations make a “fair and reasonable amount of profit,” compared with 16% of Solid Liberals. And Opportunity Democrats stand out in their belief that most people can get ahead if they are willing to work hard. Disaffected Democrats have very positive feelings toward the Democratic Party and its leading figures. Their disaffection stems from their cynicism about politics, government and the way things are going in the country. This financially stressed, majority-minority group supports activist government and the social safety net, but most say government is “wasteful and inefficient.” A large majority of Disaffected Democrats say their side has been losing in politics, while fewer than half believe that voting gives them a say in how the government runs things. A second majority-minority group, Devout and Diverse, faces even tougher financial hardships than Disaffected Democrats. 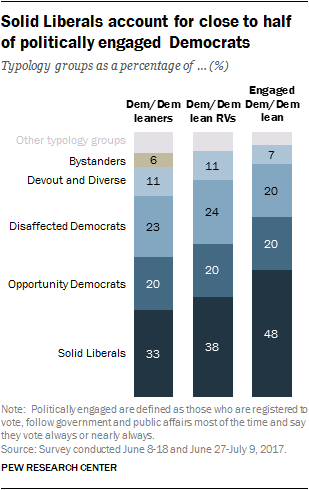 Devout and Diverse also are the most politically mixed typology group (about a quarter lean Republican), as well as the least politically engaged. Like Disaffected Democrats, they are critical of government regulation of business. They also are the most religiously observant Democratic-leaning group, and the only one in which a majority (64%) says it is necessary to believe in God to be moral and have good values. In addition to the eight main groups in the political typology, a ninth group – the Bystanders – is missing in action politically. Almost no one in this relatively young, largely minority group is registered to vote and most pay little or no attention to politics and government. While both parties are divided internally, partisanship remains a defining feature of American political life. Across the eight main typology groups, majorities either affiliate with or lean toward either the Republican or Democratic Party. The power of partisanship is reflected in attitudes about Donald Trump. In the survey, conducted in June, Trump’s job ratings are more deeply polarized along partisan lines than those of any president in more than 60 years. Overall, Trump gets his most positive ratings among the two most solidly Republican groups, Core Conservatives and Country First Conservatives. 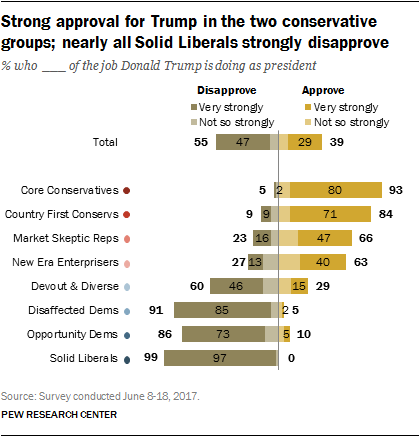 Large majorities in each group strongly approve of Trump’s job performance (80% of Core Conservatives, 71% of Country First Conservatives). By contrast, more than 70% in the three overwhelmingly Democratic groups (Solid Liberals, Opportunity Democrats and Disaffected Democrats) strongly disapprove. However, even the Republican-leaning groups who strongly approve of Trump’s job performance are not all that positive about his conduct as president. Among the public overall, 58% say they don’t like Trump’s conduct, while just 16% like his conduct; 25% say they have mixed feelings. There is no typology group in which a clear majority expresses positive views of Trump’s conduct. About half of Country First Conservatives (51%) like Trump’s conduct as president, while 39% have mixed feelings. And among Core Conservatives, who strongly approve of Trump’s job performance, only 41% like his conduct and 51% have mixed feelings. The other GOP-leaning groups are divided in views of Trump’s conduct. About half of Market Skeptic Republicans (49%) say they have mixed feelings, while roughly equal shares say they like (24%) and don’t like (26%) his conduct. And among New Era Enterprisers, more express negative (39%) than positive (23%) views of Trump’s conduct, with 38% expressing mixed feelings. Among Democratic-leaning groups, overwhelming majorities of Solid Liberals (98%), Opportunity Democrats (86%) and Disaffected Democrats (89%) say they don’t like Trump’s conduct in office. As with Trump’s job approval, Devout and Diverse offer less critical views of Trump’s conduct, though far more express negative (52%) than positive views (10%). 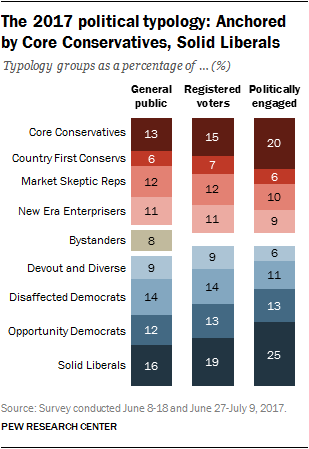 The two largest groups in the political typology – Core Conservatives on the right and Solid Liberals on the left – make up an even larger share of their partisan coalitions when political engagement is factored in. Core Conservatives are more likely than other GOP-leaning groups to say they follow politics and government most of the time and say they always vote. Consequently, while Core Conservatives make up about a third of Republicans and Republican-leaning independents overall (31%), they constitute a larger proportion of politically engaged Republicans (43%). At the other end of the political typology, Solid Liberals constitute by far the largest proportion of politically engaged Democrats and Democratic-leaning independents. Solid Liberals make up a third of all Democrats and Democratic leaners – but close to half (48%) of politically engaged Democrats. That is about the same proportion as the other Democratic-leaning groups combined. The next largest group, Disaffected Democrats, make up 23% of Democrats and about the same share of politically engaged Democrats (20%); similarly, Opportunity Democrats constitute 20% of all Democrats and an identical share of politically engaged Democrats. And Devout and Diverse, who express very low levels of interest in politics and government, make up a substantially smaller share of politically engaged Democrats (7%) than of all Democrats (11%). The 2018 midterm elections are still more than a year away, but the two groups at either end of the political typology are already highly motivated by the battle for congressional control. More than eight-in-ten Solid Liberals (84%) say it matters a great deal to them which party wins control of Congress next year, the highest share of any typology group. Core Conservatives are next highest, at 77%. At this point, other groups are less engaged by the struggle for partisan control of Congress. And the drop-off is particularly notable among three groups close to the middle of the typology. 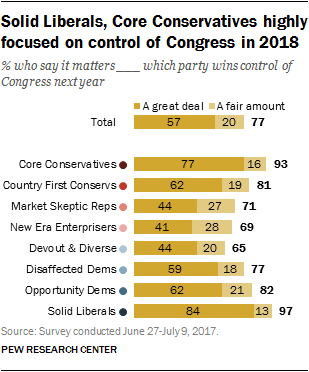 On the right, fewer than half of Market Skeptic Republicans (44%) and New Era Enterprisers (41%) say it matters a great deal which party wins control of Congress; on the left, just 44% of Devout and Diverse say the same. The political typology sorts Americans into cohesive, like-minded groups based on their values and beliefs, as well as their partisan affiliation. The current study, which comes 30 years after the first political typology, is based on surveys conducted June 8-18 among 2,504 adults and June 27-July 9 among 2,505 adults, with a follow-up survey conducted Aug. 15-21 among 1,893 respondents. The typology is not intended to measure changes over time in the electorate, but some of the internal party differences that were evident 30 years ago still persist today. For example, Core Conservatives are far more likely than Country First Conservatives to favor societal acceptance of homosexuality. In 1987, two roughly parallel groups – Enterprise Republicans and Moral Republicans – differed over a disputed social policy at that time, whether or not school boards should have the right to fire homosexual teachers. There also have been long-standing divisions among Democratic groups over religion and morality. Today’s Solid Liberals, who overwhelmingly say that belief in God is not necessary to be moral, bear some resemblance to the Seculars and ’60s Democrats from that earlier era. Today’s Disaffected Democrats and Devout and Diverse – majority-minority groups who are much more likely than Solid Liberals to link belief in God with morality – are somewhat similar to the Partisan Poor and Passive Poor of three decades ago. To be sure, there have been seismic changes in the nation and politics over the past three decades – and these are reflected in the political typology. The country has become far more racially and ethnically diverse. In 1987, both parties were overwhelmingly white and non-Hispanic; today, only the GOP is, while more than 40% of Democrats are nonwhite. Thirty years ago, one of the largest groups in the political typology were the New Dealers, an older, mostly white, mostly Democratic group who were relatively conservative on social issues but favored activist government. There is no equivalent group in today’s political typology. There have been more recent changes as well, particularly in the GOP coalition. The two conservative Republican groups are divided over immigration, “openness” and America’s role in the world, as well as homosexuality. And for the first time, there is a Republican-leaning group that is deeply skeptical of business and the fundamental fairness of the nation’s economic system. 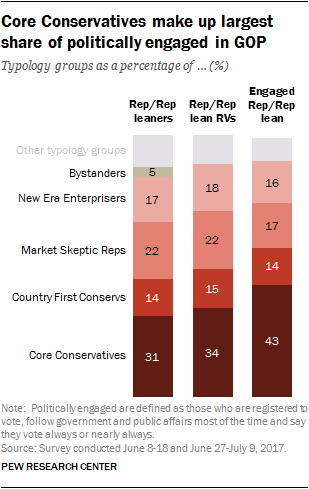 On these issues, Market Skeptic Republicans have less in common with the other groups on the right than they do with the Democratic-leaning groups in the political typology. What is the political typology? The 2017 political typology divides the public into eight political groups, along with a ninth group of less politically-engaged Bystanders. The assignment of individuals to one of the eight core typology groups is based on their responses to 12 questions about social and political values and their party affiliation (or leaning). The goal of the political typology is to go beyond people’s partisan leanings to gain a better understanding of American politics. While partisanship remains a dominant factor in politics, the current report finds – as did prior typology studies – that there are internal values divides within both partisan coalitions. See appendix 2 for additional details about the statistical procedure used to calculate the typology groups.